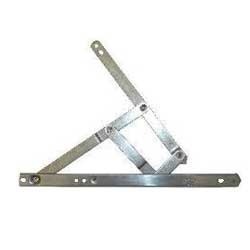 Leading Manufacturer of top hung upvc windows hinges, upvc window friction hinges, ss windows stay and upvc windows friction hinges from Coimbatore. Standard UPVC friction hinge set replaces most double glazed window hinges with an 18mm wide track. Easy - clean position allowing cleaning to the outside from inside. 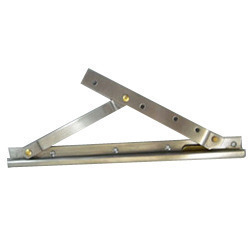 This is the 16 inch version of the egress easy clean window friction hinge. These come in a pair and are suited to most types of windows. Size (inches) 16", 12", 10"
Universal, stainless steel friction stays offer improved security and weathersealing through the use of a reduced friction, nylon end cap. Stays have been designed to offer smooth closure and high performance for window applications of all sizes. Supplied with packers to adjust stack height. Looking for UPVC windows friction hinges ?